No matter your exact level of beginner-ness (beginner-tude?) there’s probably a few things you already know about paddleboarding – for instance, that it looks cool and you really want one. But if that’s about the extent of it, you might find that our guide to the best beginners’ paddleboards is a good place to start. A lot of what makes a paddleboard great for beginners is admittedly what makes a paddleboard great full stop, but there are certain things you’ll want to look out for if you’re just starting out. First, is it stable? While you’ll need some action going on in that core to stay upright, none of us are Hugh Jackman, so look for a board that’s somewhere around 11 feet long and 30 inches wide to cheat some of that stability. Then, of course, there’s the price. While there’s no sense in splashing out on the most advanced board if you’re only going to guiltily stick it on Gumtree in a few months, there’s also no sense in cheaping out. There are a few different types of SUP to choose from, and the right one for you is all down to what you’ll be doing on it. Allround SUPs are, by and large, the best paddleboards for beginners thanks to their versatility and extra-stable shape; meanwhile, touring SUPs are wide and stable enough for beginners to learn on, but also make a great choice for more experienced paddlers who want to cover large distances. There are other, more specialised types of paddleboard catering to activities from yoga to fishing, but generally speaking, as a beginner, you’ll want to stick with one of these two for now. Finally, there’s the construction, where you have a choice of an inflatable or epoxy SUP. The former is beginner-friendly, softer to fall on, and easier to transport and store thanks to the fact that no matter how large it is it can be deflated and rolled down; the latter will need either a car rack or a vehicle big enough to accommodate a nine-foot board, and enough storage for the same, but their performance currently has a huge edge on that of the inflatable. Calling it ‘Crossbreed’ might be a little on-the-nose, but this all-round inflatable SUP boasting a design that’s large and versatile enough for all kinds of kiddos – both human and hairy – is a huge selling point. 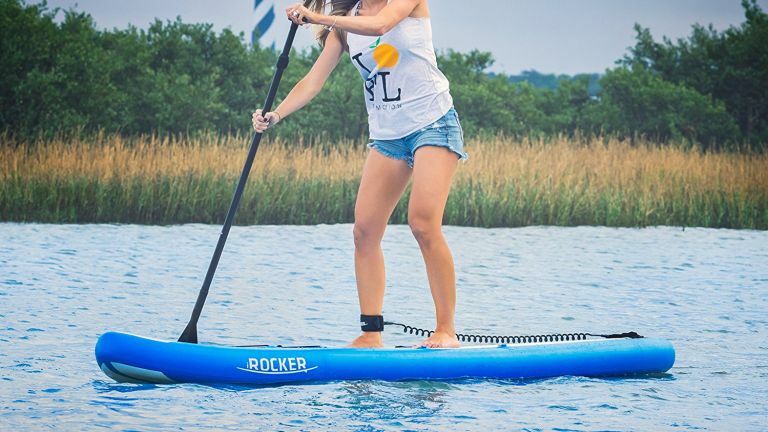 At 11 feet by 34 inches, it’s sturdy and stable on the water, wide enough to accommodate more than one paddler at once, and its maximum inflation point of 18 PSI makes it rigid and unflexing to mimic the feel of an epoxy or fibreglass board. Add to that incredibly durable DropStitch construction to see off wear and tear, plus feedback that shows this sub-£1,000 paddleboard exceeded buyers’ expectations, and you have our best paddleboard for beginners. Despite this inflatable SUP being filled with nothing but air, it’s a pretty rigid affair. Its weight limit is claimed to be similar to that of a hard board when inflated to its maximum 15 PSI, and the inclusion of military grade materials, while quite amusingly over-the-top sounding for a watersports accessory, reflects its indestructibility. The diamond-textured non-slip deck and large size mean it’s a good one for beginners to find their feet on, and the backpack carry bag is a nice touch for holidays and days at the beach, too. Enticed by the prospect of taking your yoga practice out onto the water, but not sure you can justify buying a dedicated yoga paddleboard? This Easy Rider SUP could just be your new go-to, with its sturdy oversized (11’6) design leading Blu Wave to claim it’s ideal for saluting the sun or a cheeky savasana (also known as “sunbathing” – that’s right, we’re onto you). If you’re not into yoga, it’s still a great all-round beginners’ board, and the GoPro attachment is a neat addition for when you get better and want to show off your skills. Just like the iRocker 11, above, this board counts military grade durability and extreme rigidity among its finer qualities, claiming you can run it into rocks or run over it in the car with no lasting damage. While we wouldn’t suggest you test that out, reviewers have paid testament to its sturdiness, finding it quick to inflate to an impressive firmness and strong and stable on the water, if occasionally a little twitchy. Out of the water, it’s easy to pack and carry, it rolls easily into the included backpack carry bag for unrivalled portability. Don’t let that wood print fool you, because this is an inflatable paddleboard extraordinaire. Our best paddleboard for kids, it’s light to carry down to the water, extra thick to aid balance, soft (just in case if they faceplant) and, reviewers say, easy to inflate. It also comes with a whole host of useful accessories including paddle, traction pads, removable fins, leash, deck bag, pump and even more to get them started straight away. Of course, that’s not to say you can’t get involved too, assuming you’re under the requisite 74 kgs – or 165 lbs, in real money.